Arachnoiditis is a chronic pain disorder caused by the inflammation of the arachnoid membrane and subarachnoid space that surround the nerves of the spinal cord. The inflammation can cause the meninges to adhere to the spinal cord and nerve roots. Because the nerve roots are affected, symptoms such as numbness, tingling, and burning pain are often felt in the lower back or legs. Severe cases of arachnoiditis can result in the loss of motor function, loss of bladder and bowel control and even paralysis. Arachnoiditis can arise from infection, direct spinal injury, and chronic compression of the spinal nerves or invasive spinal surgeries. 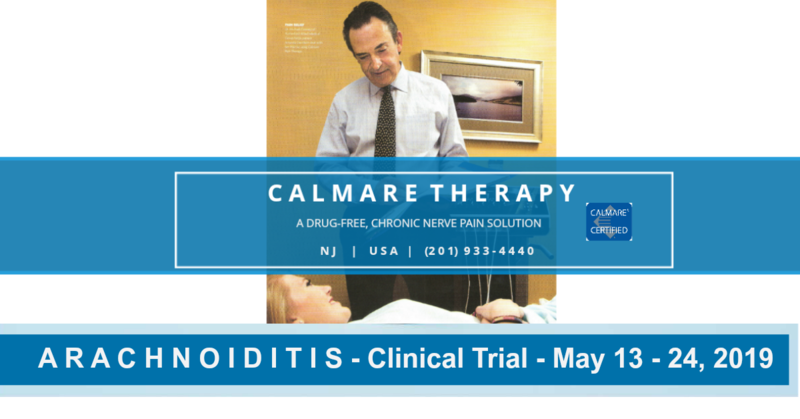 Calmare Therapy NJ USA is one of only seven Calmare Certified providers of scrambler therapy, an FDA-cleared, non-invasive, pain-free, drug-free technology to treat patients suffering from several types of long-term, high-intensity pain. We are conducting a free, 10-treatment (one 35-minute daily therapy session) clinical trial study for pre-qualified patients suffering from diagnosed Arachnoiditis to determine the efficacy of scrambler therapy as a viable treatment solution for condition-induced neuropathy. Pre-approved study patients must be available to undergo a protocol of 10 treatments once per day. There is no charge for the series of 10 treatments. People who agree to take part in the study are asked to sign an Informed Consent Form. However, signing the form does not mean approved trial participants must stay in the study for the duration. Volunteer participants can leave the study at any time—either before the study starts or at any time during the study or the follow-up period. The informed consent process continues throughout the study. If new benefits, risks, or side effects are discovered during the study, clinical trial researchers will; inform the participants. I would love to have more information. My contact number is (337) 831-8171. I have been diagnosed with AA five years ago. I’m looking for help. This is a nightmare. My pain management want me to try a permanent stimulator for the second time. At this point, Iam looking for help.